One of the greatest joys of my life is women's Bible study. The seasons when I have deceived myself into believing I was just too busy to squeeze it in have been the driest seasons - hands down - of my life. Everything is just a little harder, the light is a little dimmer, and my mind is a little foggier when I neglect meeting together with other women. It's like I lose - or at least forget - a little of who I am. The women the Lord has allowed me to study with over the years have been doers of the word. The table where we gather is merely a temporary meeting place to pause in our labor and discuss what God has been up to. Sometimes, we're serious about getting our homework done and pick apart every proposed discussion question. Other times, we never get to the workbook at all. "We cannot grow if we are not real and if we are not here to grow, we may as well go home." The group I've had the privilege of learning alongside this time has changed as the weeks have gone, with only a few faces remaining constant. Spring is a busy time, but God has been so faithful to bring just the right faces to the table at just the right time. Tonight was our fifth time gathering together. (We all agreed April feels like at least two lifetimes ago.) The masks were checked at the door months ago now and as we are wrapping up this particular study, what we have in common is the longing to see God at work in our lives. I looked around that plastic table and marveled at who God had handpicked this time. Single, married, moms of littles, empty nesters, grandmothers, and anywhere in between. Survivors: every one of us. Some of cancer, some of abuse, some of loss, all of hard seasons. Before we could find our way to our tattered workbook pages, we had to tend to our tattered hearts. 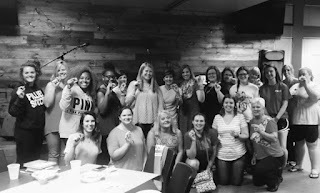 To watch a group of women who otherwise have nothing in common and whose paths would not ordinarily cross rally around, speak truth to, cry with, pray for, encourage, and embrace one another, one after the other, is to watch the body of Christ in action. It's beautiful and I can't get enough of it. But it has me thinking. How do people make it without this kind of community? Do you have "those people" in your corner? Really? Why not? All religion aside, who do you call when you can hardly cut the tension in your home with a knife? When the lines on the pregnancy test don't show you the answer you want to see? When a loved one's health is failing? When the woman in the mirror isn't who you want to be? When the bottom is falling out? When all hope seems lost? Who cares enough to look you square in the eye and remind you who you really are; moreover, who is willing to tell you you're wrong when you believe anything less?? Say what you want to about organized religion, but there's no person on this earth who was created to live in solitude. One girl in a Bible study years ago loudly proclaimed, "He's like a nasty boy in a bar!!!" I was baffled and ready to do damage control, uptight as I am. She went on. "Satan! It's like he uses the same pickup lines on all of us and we'd never know it if we didn't talk to each other! We all think we are the only one who's ever heard this mess." Try as I might, I've never come up with a more accurate analogy. When we neglect gathering together, we offer the enemy territory in our lives. We believe lies, sell ourselves short, leave blindspots exposed, and lose sight of the truth. We are created for community, designed to do life together. "Therefore, brothers, since we have confidence to enter the holy places by the blood of Jesus, by the new and living way that he opened for us through the curtain, that is, through his flesh, and since have a great priest over the house of God, let us draw near with a true heart in full assurance of faith, with our hearts sprinkled clean from an evil conscience and our bodies washed with pure water. Let us hold fast the confession of our hope without wavering, for he who promised is faithful. And let us consider how to stir up one another to love and good works, not neglecting to meet together, as is the habit of some, but encouraging one another; and all the more as you see the Day is drawing near." Life is going to keep coming at us. Drama is still going to come knocking. Winds are going to blow in that we never saw coming and knock us right off our feet. Families we dearly love are going to crumble. Tents are going to keep going up in cemeteries. We mustn't try to go this life alone. This world is NOT our home and while it is imperative to search for joy like gold in this life, it's just as important to surround ourselves with truth-tellers, fellow believers, those who are going to be real and help us grow up into the people we want to become. The ones that will lean in when we talk, weep when we weep, rejoice when we rejoice, have our backs, catch us when we fall, then grab us by our shoulders and turn us toward the one true Hope that can only be found in Jesus... those are the ones worth finding and holding onto.